My government ID expires this month. It says so right on the front, "NOV2014." I need it to enter the federal building without going through security check like they do at the airports but without the special lines and exceptions. Basically, an undocumented federal employee. So, you might think I would be getting a new one. The answer is . . . maybe. But Mr. President, why now? Well, maybe it's because we used to think elections had consequences. It really hasn't worked for the current President of the United States. He may not be the best political schmoozer and deal-maker. But its hard to schmooze and make deals with those who deny your legitimacy and are intent on proving that "government is the problem." No deal can be made with a President who is despised by your party's base. And I think it's pretty clear that this is the President's opportunity to put his political thumb in the Republican party's eye. They can't handle immigration. And they don't know what to do about the President on this. But that isn't really what I started on about my own little crisis. So, back in October I got an enigmatic email about my ID card expiring which I already knew because every time I even glanced at it is said, "NOV2014." There were no additional instructions on what to do to renew it. They are issued by Homeland Security so it's not like I can do much to boss them around. Our office administrator has been aware of this situation and has made a lot of calls about new ID's. She has had all kinds of explanations as no one is quite sure on the process. But she keeps trying. She got an appointment to get her own card today down at the special issuing agency not very conveniently located to the federal building. Maybe she'll find out more there. Yesterday, I got an email from our Division of Admin in DC. They wanted to make sure I had picked up my new ID because it has been there for a few weeks. They thought I probably had, but they were just checking. I responded that it was the first time I had heard I had anything to pick up. An office colleague took me back to the October email to reread and confirm that it doesn't really tell us anything about the process. And something just clicked today because I got another email from the issuing office that said I could schedule an appointment to go pick up my card. The first available date was December 12, about 12 days after my card expires. It might be a free day too because with the President sticking his thumb in the opposition's eye and twisting it around while they figure what to do, they may shutdown the government again. And the President thinks that would make them look bad if they can't keep their Ted Cruzes and other munchkins in line. Our current government funding goes through December 11, so any shutdown would begin on the 12th. And the ID issuing office will be closed. Problem solved. I won't need an ID if I can't go to work. 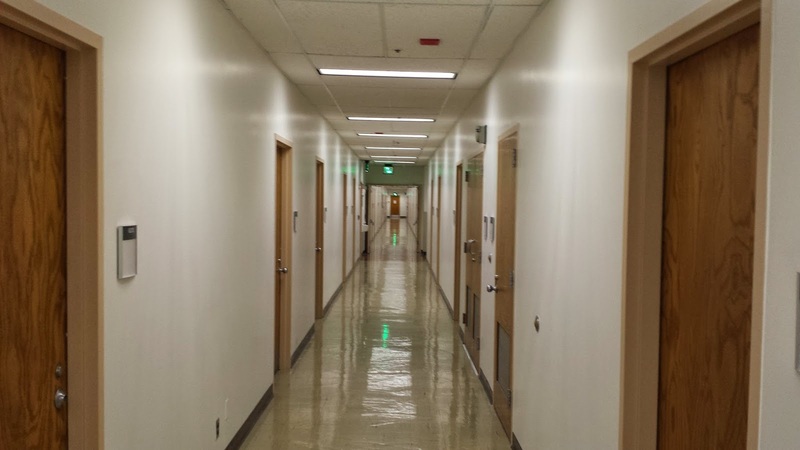 Our Orwellian hallway outside our office in the federal building. I should admit that through some bureaucratic miraculous finessing, our Admin People did get us our new IDs the Tuesday before Thanksgiving. I'm good 'til NOV2019 and hope to be out for good before then. Missionary Gratitude - Happy Thanksgiving!